In 1849, the Boudin family discovered something amazing. When making their traditional French bread, the Boudins used natural, wild yeasts from the air of San Francisco. The result was a tangy, sweet tasting bread. And thus San Francisco sourdough was created. Something about our foggy, salty air adds a little something extra that makes tasting bread in this city a rite of passage. Today, 168 years later, there are dozens of bakeries across the city using their own “mother,” or starter, with wild yeasts caught from the San Francisco air—some of which are amazing, some are not. But if you’re going to eat sourdough anywhere, we suggest you head to one of these top 5 bakeries. Chad Robertson is regarded as a bread master not just here in San Francisco, but throughout the country. The sourdough he makes is simply the best. It is crunchy. It is soft. It even tastes good when it’s considered stale. Robertson is the god father of modern bread in San Francisco, and any baker worth his salt has snuggled up with him. You can find his bread in two places: at Tartine Bakery, where loaves are available at 4:30 p.m. until they run out or Tartine Manufactory, where loaves are ready at 10:30 a.m. until they run out. Of course, loaves are made fresh every day and we suggest you get there nice and early –because they do, in fact, sell out. Run by a San Francisco native who’s been baking since she was six, this charming little outpost in the Outer Richmond does a lot more than just sourdough. Any of their pastries will send you to a gluten-full nirvana. But their sourdough batard is just the right amount of tang with the levity of a cloud. You can buy a loaf any time of day (except on Mondays), but their brunch menu is the real treat. Try the Marla’s French Toast or the bagel plate – you might be pleasantly surprised to find that San Francisco has good bagels too. While the guard has changed at this restaurant in the past few years, owner Dave Muller is still making his superior bread. Muller was given a little bit of sourdough starter from San Francisco’s bread king, Chad Robertson at Tartine Bakery, and has been baking heavenly loaves ever since. You can enjoy his creations over breakfast – the Egg in a Hole is a great showcase of the bread’s balance between sturdy crust and fluffy innards – or dinner, but there’s usually a wait for both. So if you’re just in for the bread you can order a loaf to go. 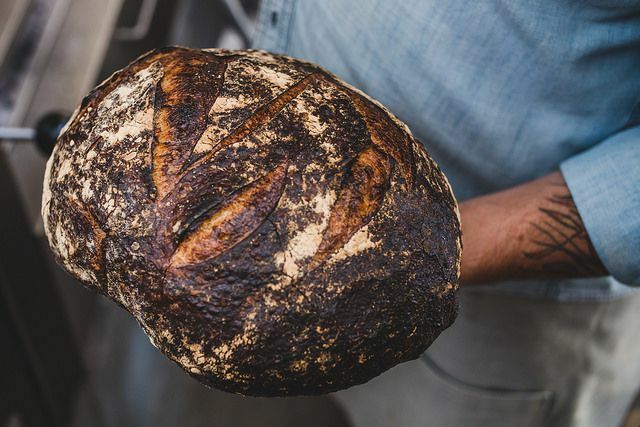 This seven-year-old bakery has been a Bay Area favorite ever since Josey Baker, the owner and bread maker (and yes, his last name is really Baker), started milling his own flour. His sourdough starter was inherited from his friend George’s grandma and results in fluffy loaves with extra crunchy crust. The Mill is also home to the infamous $4 toast, which is definitely worth a try despite the somewhat exorbitant cost. Bonus for the pizza lovers: The Mill hosts pizza nights every Monday and Wednesday. Every night is a different combination, but past pies have included golden curry cauliflower, potatoes and cilantro and sesame crust with ginger teriyaki. Founded in 1983, this bakery made its name by baking superior loaves for restaurants like Chez Panisse, where Acme’s founder worked as a baker before setting off on his own. They make sourdough baguettes, deli rolls, batards, rounds, and loaves with natural San Francisco yeast, but don’t feel you need to limit yourself to the sour stuff. All their breads are crispy on the outside and chewy on the inside. The best way to experience it is by ordering a petit ham and cheese sandwich, just like the Parisians like it.